This Valentine’s Day sweep them off their feet with a bouquet from Teleflora, given them, a bouquet will show you love like you mean it. Some new bouquets they have this year are Sweetest Satin Bouquet, this elegant arrangement brimming with classic red roses, white Asiatic lilies, red Alstroemeria and green accents. 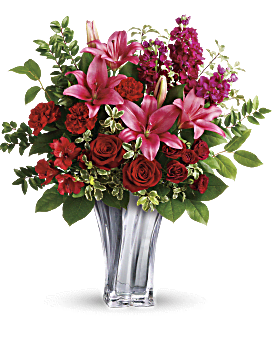 This beautiful, eye-catching bouquet arrives in a ceramic vase with a soft, satiny gloss and a quilted pattern that evokes a passionate feel. Sterling Love Bouquet add a thoughtful, modern touch of luxury for your soul mate with this stunning floral bouquet overflowing with fresh red roses, pink Asiatic lilies and red Alstroemeria nestled in a chic blown glass vase that she will treasure for years to come. Country Sweetheart Bouquet with this vintage chic French farmhouse-inspired floral arrangement. Bursting with red roses, white daisies and red carnations nestled between dusty miller and huckleberry, this two-in-one gift arrives in a cute crock that will deliver long-lasting enjoyment. 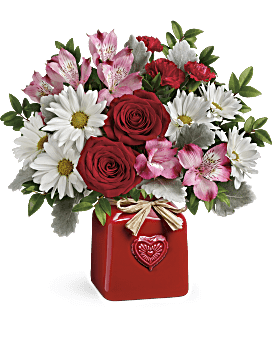 Happy Harmony Bouquet has red roses and white mums, hand-arranged a playful pattern of red and silver scattered hearts on a gorgeous glass cube, this gift is sure to brighten anyone’s day. 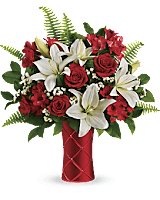 My Opinion: I got the Happy Harmony Bouquet which came from Warren’s Florist and it is just stunning with the red roses and white mums to really showcase the glass cube. I know as a woman, I love getting flowers it makes me feel loved, cared for and important. 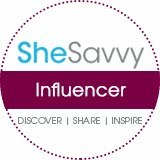 Bonito artículo, que has compartido aquí sobre el ramo de rosas de San Valentín. Su artículo es muy interesante y me gustó su forma de expresar sus opiniones en este post. Si alguien busca el enviar flores a domicilio, visite Flores Guru.